According to new data released last week, American companies “claimed” GSP for about $1.45 billion worth of imported products in February. Typically, those products would not face import tariffs because of GSP, whereas those same products imported from a non-GSP country like China would face $48.2 million in import taxes. Since Congress still has not renewed GSP, companies were forced to pay those taxes. From when GSP expired on August 1, 2013 through the end of February, the regular taxes on previously GSP-eligible imports exceeded $384 million. 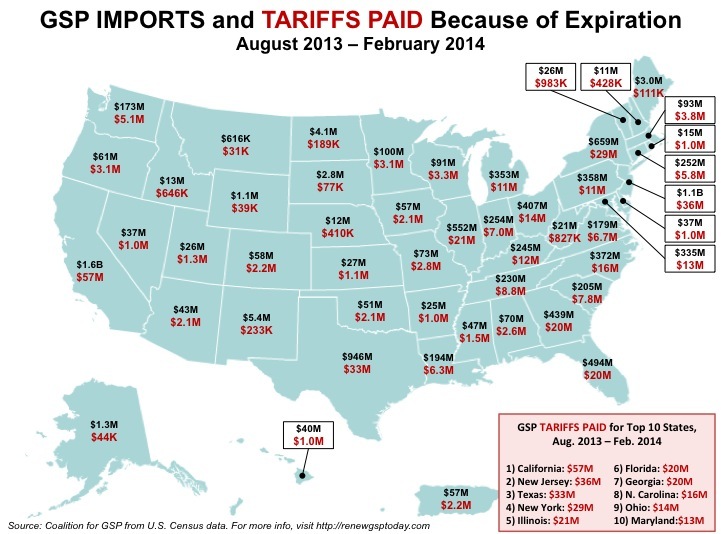 Imports destined for California alone faced tariffs of more than $57 million. But it’s not just companies in big states that are impacted by GSP expiration. Rhode Island, Delaware, and Hawaii were three of the nearly 40 states that faced $1+ million in higher taxes, as shown below. Of course, the impacts of GSP expiration go far beyond the cost of taxes paid. Higher costs often mean lower sales, so GSP importers face a real cash-flow squeeze. They’re spending more to sell less, with predictable results: layoffs, hiring freezes, and delayed investments, as documented in this report. Yet it will get worse before it gets better. Congress is once in recess and won’t return until the end of the month – meaning American companies will pay tens of millions of dollars more before Congress even gets back to DC. This entry was posted in California, Delaware, Hawaii, Rhode Island. Bookmark the permalink.